For women starting a career in IS: we are needed. We think about things in a broader way, I think inherently because of the way our lives are shaped. So that perspective is needed for better, more robust systems and systems design and thinking. They’re not going to be better if its not for us being there. Information Systems is more than coding. It involves people, company procedures, and technology in business. Don’t just look at it as a technical field as some people do. There is a human touch side to it. That is what really interests me and got me into this field. You will be able to shape tools and products that are being built. Also, you get paid a lot. So that’s nice. The career path for women in IS is wide open. It is a wonderful, wonderful career. The field is just becoming bigger and bigger, with more and more opportunities. You can go code. (Eleanor Loiacono) Yeah if you like that you can do that. You can do the human side. There’s a lot of opportunity. Go for it. Yeah, my advice is, "Go for it!" I’d like to support all women to follow their dreams and aspirations. Do it! There are not enough women, and I do think it takes a woman’s touch sometimes. It is exciting, relevant, important. Everyone should consider it. It’s the future. That’s it. 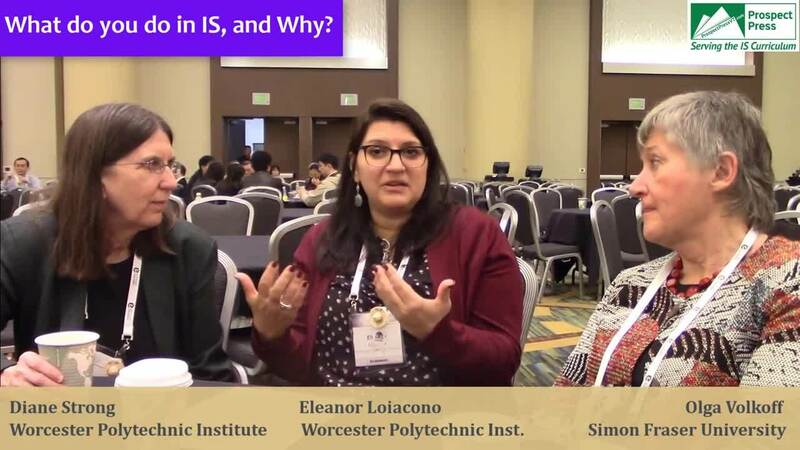 Thank you to AIS for providing space for us to film at the ICIS 2018 meeting in San Francisco.